Offering you a complete choice of products which include punch grid resistors. Resistors are designed to meet requirements of both A.C. & D.C. applications. The basic types of resistors are stainless steel (Grade - 304) and punched steel resistors. 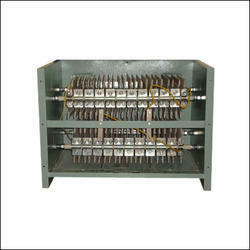 These are manufactured for current rating from 10 to 800 Amps. Continuous resistors of higher ratings are manufactured using 2 or more parallel paths. Resistors with short time rating up to 3000 Amps or even more for neutral earthling are possible which suitable for system voltage up to 11 KV and above. E.O.T. cranes, rubber mills, steel mines, cement mills, power plants, conveyors, coke oven, blowers etc. for speed control and developing starting torques. These resistors consists of stainless steel wires or strip in form of grids. The current rating generally ranges from 7 Amps to 400 Amps continuous with multiple or single paths. Punched steel grids resistors:The Resistors consists of grids punched from correction resisting nickel chromium alloy sheet steels. The punched steel grids are completely immune to shock vibration. They function reliably under the worst operating conditions and are particularly suited for steel mill duty. These resistors are available in wide range of current rating from 8 Amps to 800 Amps continuous with single & multiple parallel paths. Looking for “Punch Grid Resistors”?